How to fool Australian drug sniffer dogs. 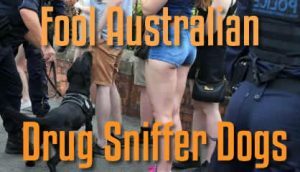 People who think they can fool Australian sniffer dogs are only fooling themselves. While there are those who lay claim to dodging drug detector dogs, there is only anecdotal evidence of its success. You risk going to jail if you take on the drug dogs. Australia is famous for its lifestyle and music festivals. Attracting thousands of tourists seeking a fun time. It also seems a national pastime for festival goers to try sneaking drugs in past the drug sniffer dogs. Festival patrons know the dogs are there. Guarding the gates as they walk through. But, regardless, it does not stop many from trying to fool Australian sniffer dogs when it comes to slipping their stash in. People use all sorts of weird and wonderful methods – from Vicks VapoRub to Vegemite – to hide the smell from the sensitive noses of trained Australian drug detector dogs. What these people are thinking. They know sniffer dogs wait at the gate, checking everyone as they go through. One bright spark from France, found out the hard way it is not easy to fool Aussie sniffer dogs a Melbourne’s Electric Parade festival. They saw him coming from metres away. Romain Franche, 22, a former French gondolier used Vegemite to mask the smell. But, it did not work. He smeared the iconic Aussie yeast spread all over the drug packages in an attempt to get his drug stash past the dogs. Caught with a cocktail of drugs – hash, MDMA, ecstasy, cocaine, ketamine and coke – worth around $3000. Franche working in Australia as a French antique salesman and Yarra River gondolier now faces a $4000 fine and deportation back to France. Masking drug odours from our trained canine friends is not as easy as you may think. It is actually impossible. But, you can try. What may mask an odour at first will have the odour permeate it in a short space of time and soon become detectable. Lead is the best for blocking odours because it is a nonporous material and it traps odours within. But, you can hardly walk around carrying a lead box for your drug stash. It is going to look suspicious if the drug detector dogs are out at transport depots and big party events. Using things like foil, glass and freezing are all good. Right at the start. This may only work for a super short time. It does not matter what you wrap some drugs in, the odour will escape. But, trying to fool the nose of a canine who can discern the difference between odours can only lead to trouble. So, it does not matter what you think will work to get your stash past the dogs, try it and you will get caught. Sniffer dogs – good or bad for the community? People going to music festivals expect to see sniffer dogs and they are a common sight. In New South Wales police send dogs into bars and clubs. They patrol railway stations and in the streets. This raises the question of how effective the use of sniffer dogs is in preventing drug use. It is a hotly debated topic as people in the firing line of a canine nose may panic and swallow their whole stash to prevent detection and a drug conviction. This was seen at a festival in Adelaide, late 2015, when two people overdosed with multiple people hospitalised. A community outcry questions whether sniffer dogs have value with members of parliament supporting this call. They feel that using sniffer dogs in the streets, bars and festivals is opportunistic and turned all people into suspects. Opposed to where police use sniffer dogs to search a property or at institutions to catch people bringing drugs in. Labor and Greens MPs put a Bill to the NSW parliament to repeal the current use of sniffer dogs. And, Victoria undertook a parliamentary enquiry into the use of sniffer dogs at music festivals late 2015. Results are unknown of either of these. The purpose of sniffer dogs is to deter festival goers from bringing drugs in, they cannot stop people from using. People need to take responsibility for their actions. Police say sniffer dogs send the community an important message that drugs are not tolerated in the community. Trying to fool Australian sniffer dogs and you will end up looking the fool. Anyone claiming they fooled the dogs were extremely lucky or they are telling tall tales.